Loughborough University and Loughborough College students can make big savings on bus travel with Kinchbus. There are several town routes to help you get around town, and our sprint runs right on to the university and college campuses. Kinchkard is the quick and simple way to save money on travel around the Kinchbus Universe. Whether you use the bus every now and then or every day of the week, we'll have a Kinchkard to suit your needs. 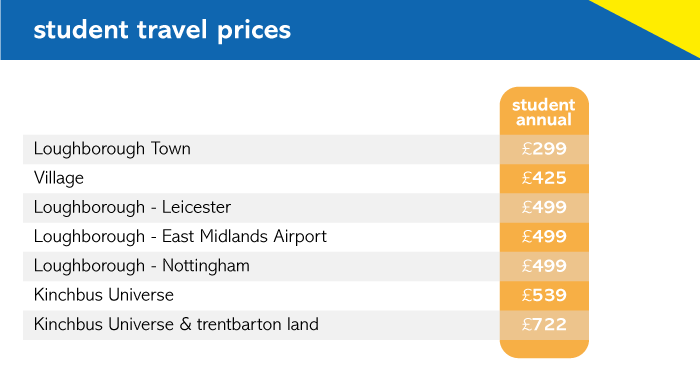 Just pay upfront, then your travel for the rest of the academic year is sorted. You can buy your annual student Kinchkard online, or you can buy one from us at the Loughborough University welcome events. All students must have a valid academic email address in order to validate your student status. To make that student loan stretch a little further each term, you can pay for your unlimited bus travel by direct debit over 6, 7 or 8 month instalments. Sorry - direct debits are only available for purchase in August, September and October. They will be available again at the start of the 2019 academic year. If you prefer to live in the moment, you can buy singles from your driver or a 10 trip and 28 day Kinchkard - you won't be making any student savings - but may be the best option if you only plan on travelling occasionally. 10 trip and 28 day Kinchkards can purchased and renewed online, or through your driver. sprint is the fastest way to get to your lectures, with buses every 10 mins during term time, and is perfect for early birds and night owls. sprint runs to both campuses, and drops you off right in town and at Loughborough train station. 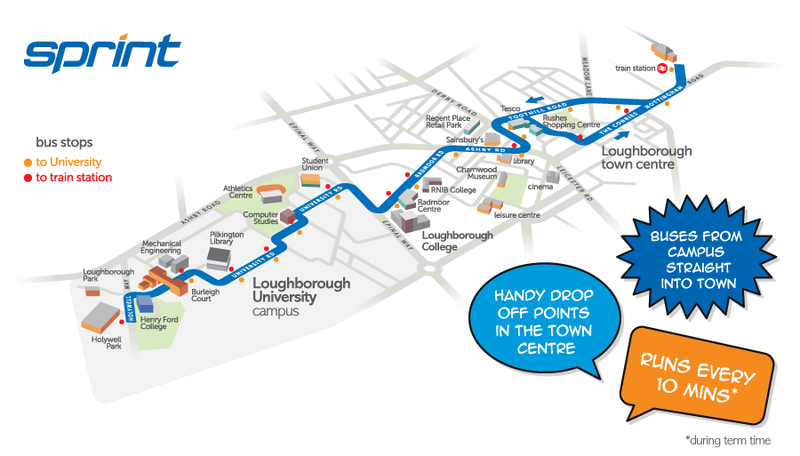 If you need travel around the Loughborough University campus, we run a free campus shuttle bus between 7.30am until 6pm, Mondays to Fridays during term time. You can also travel for free on sprint on the university campus, however this is only between 7.30am-4pm, Mondays to Fridays during term time. Kinchbus run frequent routes to Nottingham, Leicester and Derby, and for you jet setters, East Midlands Airport 24 hours a day.